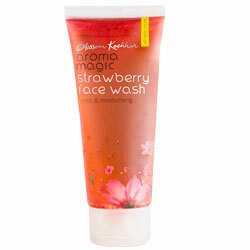 Aroma Magic Strawberry Face Wash - Gentle, Mild & Soothing Face Wash - Purify & Hydrate With Strawberry Fibres & Aloe Vera Extracts. For all skin types. 100% free of paraben, soap, alcohol, artificial colouring & fragrance. Purify & hydrate with strawberry fibres & aloe vera extracts, without drying your skin. Soothe & moisturise with a blend of rose, geranium & ylang ylang essential oils. Leaves face squeaky clean and fresh. Paraben, soap, fragrance, alcohol and artificial coloring free. Apply to moist face & neck. Massage & rinse off properly. Use every moring & night, moisturise & use sun protection for best results.